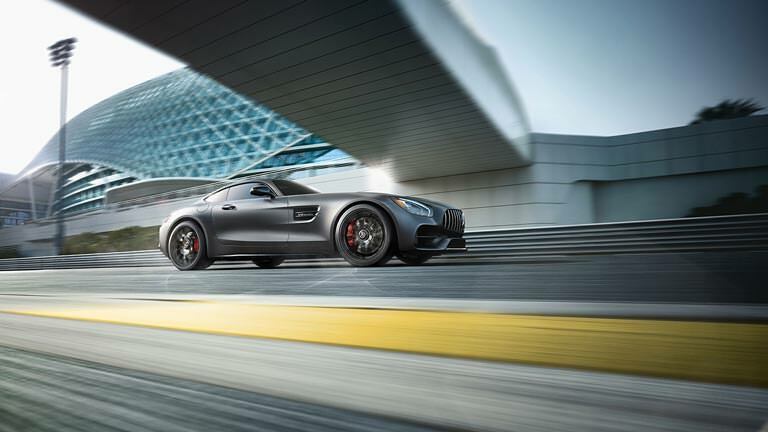 Mercedes-AMG developed the new GT model to be a pure sports car with an ideal sense of balance. From its proportions to its sound, every element reveals its purpose, and its passion. A Mercedes-AMG engine only starts with the state of the art. From there, everything from fuel pressure to exhaust routing is developed to quicken, heighten and intensify its response, and yours. Developed for AMG’s racecars, patented NANOSLIDE cylinder walls cut friction, raising endurance and power. Handcrafted AMG 4.0L “dry sump” V8s unleash a torque-rich growl. Twin turbos mounted inside the “hot V” force-feed massive boost to each Direct Injected cylinder, to thrust the 469-hp AMG GT to 100 km/h in 4.0 seconds, and both the 515-hp AMG GT S and 550-hp AMG GT C to 100 km/h in just 3.7. Adheres to racing principles, and to every curve and contour. The 4-wheel double-wishbone suspension employs highly rigid, lightweight forged aluminum components. Rear coil-overs are direct-mounted the hub carriers. Available 3-stage AMG RIDE CONTROL adapts to road, track and driver. And multimode AMG DYNAMIC SELECT lets you dial in key performance parameters. 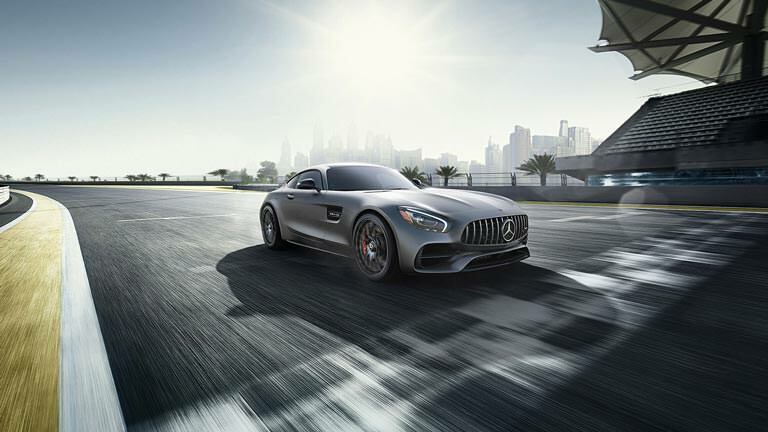 The available AMG Track Package hones an AMG GT S or GT C to an even sharper edge. Using electromagnetic fluid, dynamic engine and transaxle mounts progressively stiffen to keep handling precise. Power peaks over a wider rev-range in the Manual and Race modes. And the chassis is tuned to a more aggressive profile. Helping create an ideal front/rear balance, a rigid carbon-fibre driveshaft links the V8 and rear-mounted 7-speed AMG SPEEDSHIFT® DCT transaxle. With selectable modes and rev-matching, it’s alarmingly quick yet astoundingly seamless. 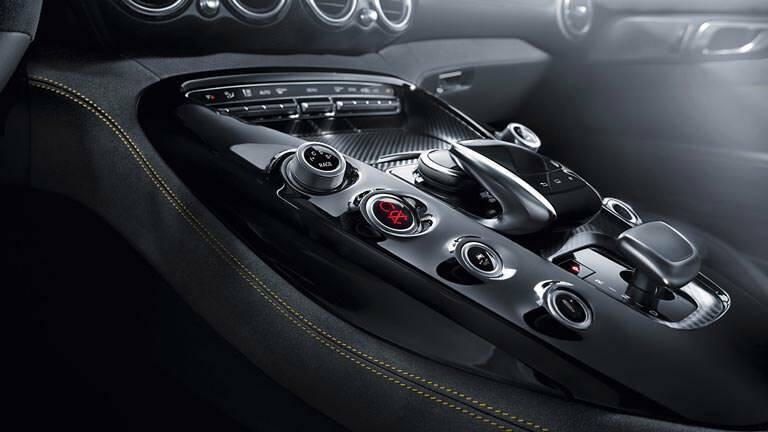 The limited-slip diff adds electronic control on the AMG GT S.
Carved from a singular passion. 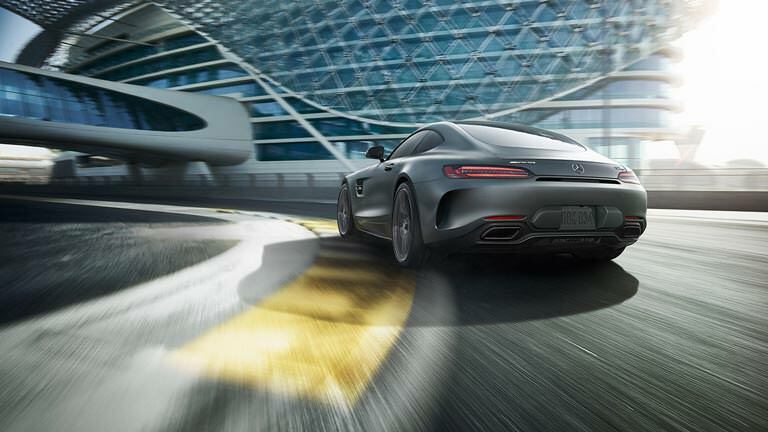 The AMG GT is sculpted to conquer wind and weight, and capture stares and hearts. Proportions celebrate its rear-wheel-drive power and ideally balanced chassis. Brilliant details turn airflow into athleticism. The result is a timeless yet trendsetting sports car that seduces your gaze to linger. A shrine to high performance. The cockpit envelops your body, heightens your senses, and connects with your instincts. A dramatic, V-shaped console and crisp readouts convey the power of precision. The thick steering wheel and intuitive controls put you in command and at ease. 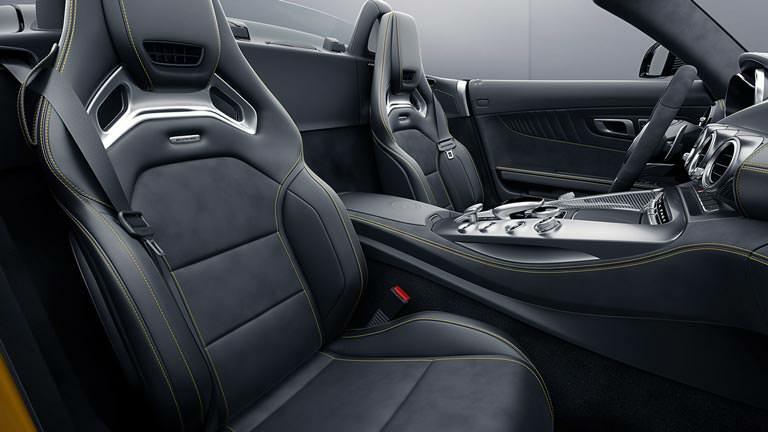 Contoured AMG Performance seats support your every move.